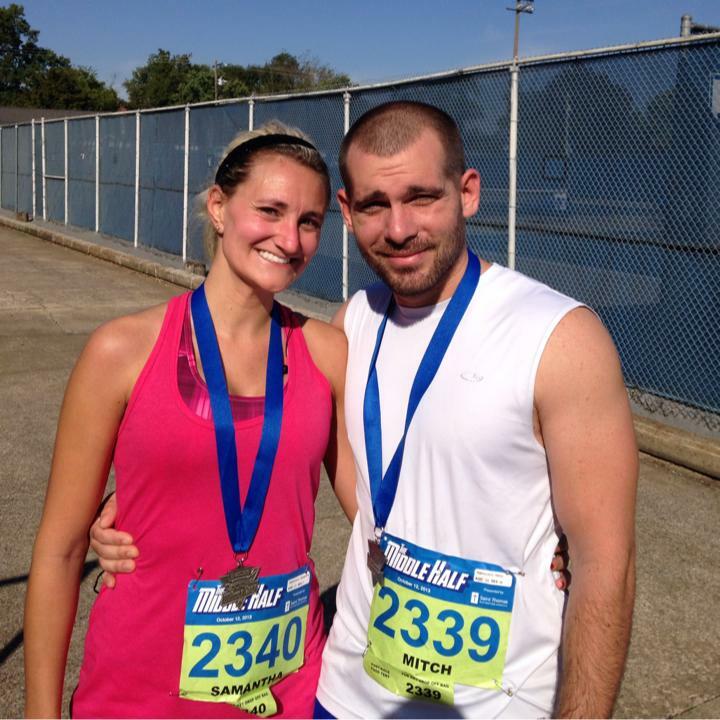 On Saturday, October 12th, we ran the Murfreesboro Marathon! They only allow 3000 people in this marathon so it is hard to get in! In order to get into this, you need to be online when registration opens as it sells out within a few hours! The reason it sells out is because it is a fantastic marathon! What can I say…it is in Murfreesboro! Well that is not the only reason it sells out! It is a nice FLAT course! The course is well set up, starts at the track field and winds throughout the city! It gives you the opportunity to take in all of Murfreesboro! This was an interesting one for me as I have not been training prior to the Marathon. I had really only ran 3 miles once a week for a good month prior. Yes, I was concerned as to whether I could make it! I had my exit plan put together (since it was close to our home) in case I felt that I could not make it! Our son Mitch and his wife Samantha joined on this run! I always love it when we have family with us! Mitch had not ran in a long time and Samantha had ran a 1/2 marathon the week before. David and I walked to the start line from our house…that was the most beautiful part of this! No having to get up at 4 am and find parking, etc. We woke up at 6 am….showered and left the house at about 6:30! The race started at exactly 7am…Off we go!!! It was a beautiful day right around 50 degrees (perfect running weather). I was running and feeling darn good and surprisingly there were no thoughts of escape in my mind. A little before mile 6, Samantha was by my side (however, I didn’t even know it). She had told me she had been running by me for a good 2 minutes. At that point in time, I will have to say that I was stealth focused. I was doing so good, that I told myself I was going to run the first 6 with no walking. I was thinking about my Aunt Sandy and Hattie’s father whom are both struggling with Cancer…and I said to myself…you have no right to complain…and God has blessed you to be able to even run like this! Tears welled up in my eyes…and strength came to me from up above! This race was going to be dedicated to Sandy and Hattie’s Dad! Sam and I ran together for a bit, and I told her to go ahead…as I just don’t run fast. It took her a bit but she did finally move ahead of me. Funny thing is I could see her in front of me, pretty much the whole race! It was heartwarming! I saw David once as we doubled back on one of the streets and he looked great and was doing great time! I never saw Mitch on the course and was worried…but Samantha told me that his mission was to beat her in the race! She said he was well ahead of us! Well I made it to mile 6…no walking…then I said..I can do 8 with no walking. I made it to 8. Then I told myself, I can to 10 ….and I did. After 10, one of my legs started hurting so I walked a little bit while getting water! It is amazing how a lot of this is in your mind! I actually ran 10 miles with literally NO training! I probably could have ran the whole thing..but I let my mind and my leg get to me! All in all, I ran about 12 of the 13.2 half marathon! As I entered the finish line, I heard my name blasted across the speaker and immediately saw David, Mitch and Samantha waiting for me on the sidelines. It was a great feeling to have family there all together when I finished. David finished first out of all of us with a time of 2:13 . Mitch came in second at 2:15..this was his personal best! I am so proud of him! Samantha came in third with a time of 2:36 and of course, I came in last with a time of 2:39! Running through our city and last but not least…finishing with Family! What a great run! This entry was posted in All Marathons, Family and Running and tagged Family Running, First Couple in the World to Complete a Marathon on Every Continent Together, Murfreesboro Marathon by TwogetherRunners. Bookmark the permalink.